i have attached a conformed version of Section 101(b) reflecting the new Waxman amendment's proposed changes for your reference. The dilemma posed by the current Section 101(b)(2) is that exclusions to the lead standard are basically impossible to obtain. There have been several rejected exemption requests and much pleading by Nancy Nord and Anne Northup for changes providing flexibility. Last December, Mr. Waxman (supposedly with input from Chairman Tenenbaum) launched a sneak effort to implement something called the "functional purpose" exemption to "solve" these issues. The original construct of this exemption applied to situations where the manufacturer could demonstrate that the lead served a "functional" purpose and could not be removed without consequences (not including economic loss). This provision would have permitted ATV manufacturers to assert the need to put lead in certain parts to strengthen the steel, for instance. The functional purpose concept derives from a similar procedure under the EU's ROHS-WEEE and is also present in the treatment of electronics under the CPSIA. Waxman's functional purpose language generated howls of protest as the "solution" solved nothing for anyone. Later, the Commission could not agree on a functional purpose recommendation for its January 15h report, and the idea "died". In the new Waxman Amendment which emerged last week, a new version of the functional purpose exemption was introduced to modify Section 101(b)(2). You may find the conformed version of Section 101(b)(2) helpful in understanding how the new provision works. a. The limitations of the exemption process in Section 101(b)(1) are UNCHANGED. In other words, the problematic "any" language is still effective. The new functional purpose exception will be an exception to the exception. Get it? b. The Section 101(b) structure which limits exceptions to specific products, materials (or component part, in the case of the functional purpose section) remains in place. The language does NOT permit exceptions by product class. You must apply product by product, material by material. The rule even specifies that each component must be individually considered. How many parts are in an ATV . . . .
c. The Commission is now allowed to act "on its own initiative" to exempt "a specific product, material, or component part". A petitioner may also seek the same relief. It is hard to imagine how this would take place - will a Commission of five people pick lucky companies or industries for random acts of kindness? Of course, the first products likely to be accorded this "on its own initiative" treatment would be books, ATVs and bikes because of political pressure. [Let's not call that "influence peddling".] More complex product categories, like school supplies (my industry), would be stuck without an effective means to seek exemption. d. The process, regardless of who initiates it, will be subject to a notice and comment period. This is new and presumably is designed to enable consumer groups to "participate in" (read, slow down or obstruct) the exception process. You have to hand it to the authors of this provision - they found a way to make a slow, expensive and tedious process even worse. "(i) the product, material, or component part requires the inclusion of lead because it is not practicable or not technologically feasible to manufacture such product, component part, or material in accordance with subsection (a) by removing the excessive lead or by making the lead inaccessible." This clause has several tricky parts in it. First, the word "practicable" was supposedly chosen because of a Supreme Court decision holding that "practicable" implies consideration of economic factors. So bickering over what "practicable" means is almost certain under this provision. The legal standard will need to be developed to make this provision workable - another nice project for Cheryl Falvey and her CPSC legal department. No guidance has been provided on how much economic pain needs to be incurred before lead removal is deemed not "practicable". Consider for instance the use of recycled metal for bike frames. When is removal of lead from bike frames not "practicable"? Each frame is presumably different. Virgin metal is available without lead. You figure it out, I can't. Let's not forget that the amendment also uses the term "technologically feasible" as defined in CPSIA Section 101(d). The CPSIA definition omits any reference to economics - intentionally. So the phrase "is not practicable or not technologically feasible" means that it is either too expensive or impossible to remove lead. This makes no sense to me, as the term "practicable" with its advertised meaning incorporates technologically feasibility and makes inclusion of the latter term duplicative. If there is a reason to use both terms, I can't figure it out. Readers? In addition to the problematic standard of "practicable", the petitioners must also demonstrate that it is both too expensive to remove the lead to levels below the standard AND also too expensive to make the part inaccessible. Since the standard for "too expensive" (not "practicable") is not specified, this language means we must invite the CPSC, the Commission and (due to the notice and comment period) the general public and our competitors into our business processes. That rag-tag lot will get to decide whether the expense of money on the removal of lead from the subject product, material or component is "practicable". Yes, that's what it means - you must publicly expose your judgments and economic choices to the Commission for their feedback and approval. Presumably, this would require you to publicly disclose your costs to obtain the "not practicable" decision. That really sounds like FUN! I can't see a deterrent to submitting a petition . . . can you? "(ii) the product, material, or component part is not likely to be placed in the mouth or ingested, taking into account normal and foreseeable use and abuse of such product, material, or component part by a child; and"
Two years ago, I might have thought this was reasonable language. In a world where logic prevails, this language is something that most companies could fairly easily (and probably already do) consider. However, after Ms. Tenenbaum's testimony about rhinestones on September 10, 2009 in which she speculated about the ingestion of 50 rhinestones by a child, it is hard to predict which imaginary risk the CPSC will fixate on. Recent events suggest that "foreseeable" is now in the eyes of the beholder. "(iii) an exception for the product, component part, or material will have no measurable adverse effect on public health or safety." This third plank in the exception standard is supposedly meant to connote that contact with a subject product which produces less than 1 micro-gram per deciliter change in blood lead levels (the smallest increment for measuring blood lead levels today) is okay. It does not say so explicitly but wink-wink-nudge-nudge, that's what it means. Unfortunately, the precision of this "standard" promises more than it delivers. There are few identifiable lead threats in children's products that could foreseeably cause this kind of change in blood lead levels other than lead-in-paint (probably above 90 ppm, too) and lead in jewelry. So if each case must be argued and decided, isn't the standard and the process some sort of sham? I think the difficulty and expense of proving the negative in this case is a strategy by the Dems to keep their ridiculous standard in place while appearing to be magnanimous in offering an exception process. Few companies will get exceptions. Sadly, fear does not allow for the use of science. There's a lot of hypocrisy here, too. Apparently, the risk from lead in handlebars of a bike is far more worrisome than lead in our air, water or food supply. Likewise, it must be far more serious than, say, lead-in-paint on cars and boats (both of which are perfectly legal). And for those cases which this law obsesses over, lead-in-substrate in children's products, the zealots cannot agree on how to measure what's safe - mainly because they don't know. Let's not forget that Commissioner Bob Adler wrote a lengthy paper )with 89 footnotes) on how there is NO safe level for lead. The non-scientists who now control this issue have even drafted a MOVING target for safety - it is dependent on what we can measure. If we can measure lead blood levels more precisely in the future, the exception standard will automatically tighten. Like a noose. f. The Commission can require a warning label for those items afforded an exception under this strict standard. What? Are they going to warn us that the product is safe? No, it's Proposition 65 creeping into federal law - apparently, the Dems think that the Commission may decide to warn the public that they weren't able to rid these items of lead, even though they have determined in an investigation that the products are safe. Again, since the zealots think "there is no safe level for lead", it is very scary for them to concede that anything could be safe if it contains lead. This is a belief system, stop trying to figure it out. Btw, have any of you ever tried selling a children's product with such a warning label? At our company, we would drop such an item rather than try to sell it. No one will buy such a product for their child or for use in their classroom. The imposition of a Prop. 65-style lead warning on a children's product is a tacit ban. g. The petitioner has the burden of proof in applying for an exception under this provision. That means a small business has to make the same case as a Big Business. Why not simply say that small businesses can't have an exception under this provision? The petitioner may utilize data submitted by other petitioners in making its case, but there is no requirement that such data be made publicly available. In recent cases, the submission of the petitioners has not always been made public. h. The language allows a sunset date to be imposed for the exceptions, even though the very terms of the exception requires that the CPSC conclude that public health and safety will not be imperiled by sale of the product. I am made to understand that the motivation behind this illogical provision is that exceptions should not last forever. Why not? I think it's the belief system again, or it could be some sense of unjust enrichment. In any event, the CPSC would be empowered to force the continued gratuitous erosion of a company's cost structure for no particular reason other to remedy the offense of an exception to the rule. i. The exception will have retroactive effect unless otherwise specified by the Commission. This sounds good . . . other than the fact that we have been shooting our businesses in the foot since August 2008. The ability to give retroactive effect to exceptions might have been valuable two years ago. To put it in an amendment now, two years too late, is an insult to the regulated community. Alternatively, it is yet more evidence of the absolute inability of Democratic legislators to even SIMULATE understanding of business issues under this law. Next up - discussion of the Resale Shop Exception under Section 101(b)(3). 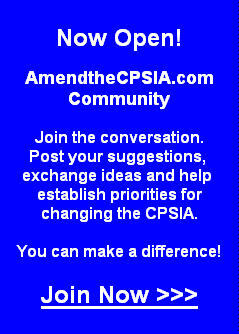 CPSIA - Why Have Five CPSC Commissioners? CPSIA - A 52-Page Morsel for You to Nibble On! CPSIA - Anyone Care about Penalties Yet?